The recent DAO hack has called into question the speed and aggressiveness with which the Blockchain (and specifically Ethereum) community has moved forward on Blockchain applications. Amid many calls for reflection, one that I found especially convincing is Joi Ito’s call for a layered approach to Blockchain design (ironically posted just before the hack occurred). While some have already proposed a layered approach to the Blockchain, many (but not all) treat the Blockchain as the base layer, which is like building a skyscraper starting at the 30th floor. Focusing on deploying complex applications on top of a Blockchain is, in my opinion, premature, as the DAO hack has demonstrated. Instead, the Blockchain itself should be decomposed into separate layers in order to better understand the security and economics of Blockchain design. Below I propose such a decomposition and argue why it is both natural and useful. The physical layer: the actual medium that transports the bits whether it be wireless spectrum, cable fiber, or phone lines. The network layer: manages addressing and routing of packets between different physical routers, most commonly IP. The transport layer: manages raw connection state, most commonly TCP. The session layer: manages higher level connection state, such as HTTP. The application layer: where actual applications live, e.g. Google search, Facebook, etc. 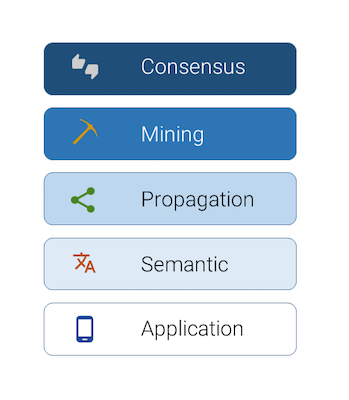 Consensus layer: a protocol that describes the format of a ledger that is publicly visible and a consensus function that anyone can use to determine which of multiple candidate ledgers is the consensus ledger. The protocol must also allow new blocks to be added to the ledger. Mining layer: a protocol that incentivizes parties to maintain the consensus and add blocks to the ledger. Propagation layer: a protocol that determines how the ledger and blocks are transmitted between nodes in the network. Semantic layer: a specification of how new blocks must relate to previous blocks and a protocol for verifying conformity with the specification. Application layer: application code that implements some desired functionality. The first four layers encompass what we think of as the Blockchain, while the application layer allows for overlays, APIs, applications, etc. Before continuing, I want to point out that the consensus layer described above is different from the one used in Eric Lombrozo’s decomposition. 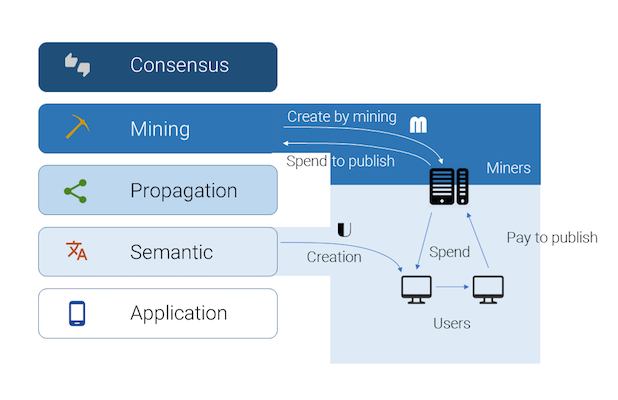 His use of “consensus layer” corresponds to our consensus + mining + semantic layers combined, while his “peer-to-peer layer” corresponds to our propagation layer. Why four layers instead of one? Treating the Blockchain as a single layer is like lumping everything between the physical and transport layers in the Internet into a single layer. While it’s fine to ignore these layers and treat them as one once they’re mature, at this moment Blockchain technology is too young and we don’t understand these base layers well enough. These properties are drawn from the survey of Bonneau et al. though we chose to rename [eventual consensus → stability] and [exponential convergence → security] for clarity’s sake. I’d also like to point that the term security is used above in a narrow sense to only mean the security of the underlying protocol. There are attacks that rely on creating unintended transactions (this is what occurred in the DAO hack) that may be called security problems, but are the result of buggy code and not a security breach in the protocol itself. Which layer does cryptocurrency live at? Because existing Blockchains including Bitcoin and Ethereum work at all four layers (consensus+mining+propagation+semantic) simultaneously, it’s not immediately clear at which layer cryptocurrency “lives”. In fact, it lives at two layers and in two different forms. This fact is implicit in Bitcoin and explicit in Ethereum. The mining layer: Bitcoins and Ether are created and/or transferred as valid blocks are created and added to the ledger. The currency is either generated from the network itself (“out of thin air”) or taken from the transactions contained in the block (“transaction fees”). The currency is used to maintain an incentive for miners to hash blocks. The semantic layer: Bitcoins and Ether can be transferred among nodes at the semantic layer by creating valid transactions signed by the holders of the cryptocurrency or by creating smart contracts that transfer the cryptocurrency between accounts. Here the cryptocurrency is used as a store of value and means of payment. Since Ethereum is a general-purpose VM, you can also create alternate cryptocurrencies at the semantic layer to be used in the application layer. For example, DAO tokens functioned this way. These alternate cryptocurrencies live only at the semantic and application layers. 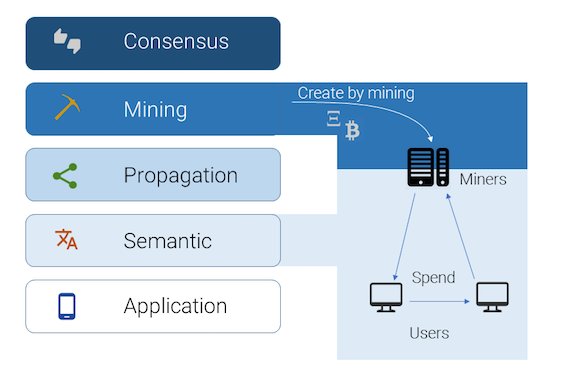 While the fact that cryptocurrency is used to incentivize mining makes them valuable and hence attractive as an asset at the semantic layer, there is no reason that they should be the primary asset at the semantic layer. We’ll argue farther down that there is a strong case to be made for strictly limiting the mining cryptocurrency to the mining layer. This decomposition allows us to reason about aspects of the Blockchain in manageable chunks, and should help us provide more rigorous arguments for evaluating design choices when building Blockchain technologies. Let me end the post with a proposal based on this layering that could help improve the security and flexibility of Blockchains. As mentioned above, existing cryptocurrencies live both at the mining layer and the semantic layer of the Blockchain stack. We argue that mining coins (the cryptocurrency used at the mining layer) should be usable only at the mining layer, and even more stringently they should only support two operations: creation and consumption. In addition, consuming a mining coin doesn’t mean transferring it from the publisher to the miner, consuming a mining coin means attaching it to a block and retiring the coin when that block is confirmed, sending it back into the void where it came from. Note that we have explicitly prohibited mining coins from being transferred between nodes. This restriction improves security because it means that it’s literally impossible to steal mining coins, eliminating fraud at the mining layer! Of course, the question becomes how do people get their hands on enough mining coins to use the Blockchain? The distribution of mining capacity is uneven and will be concentrated in the hands of dedicated miners, so we must have some means of reallocating mining coins. A node who wishes to publish a transaction t but doesn’t have any mining coins to spend on publishing will attach a related contract t’ that says “transfer n user coins to the node who attaches enough mining coins to allow both t and t’ to be published”. A miner who has mining coins could then take t and t’, contribute enough mining coins to the block, and publish them together in order to obtain the n user coins. User coins can be structured using a different economic model than mining coins. For example the creation and transfer of user coins can have rules that reflect a central banking model, a community currency model, etc. Multiple models can exist on the same Blockchain. The user coins can also have fraud prevention measures, e.g. a trusted third party who is allowed to reverse certain transactions. Even if one type of user coin is compromised, the system can survive by switching to a different user coin. Thus, the fundamental viability of the network can be decoupled from the economics of the semantic layer (at least to some extent). The issuance models of existing cryptocurrencies are extremely ad hoc: Bitcoin has a predefined schedule of Bitcoin creation, Ethereum has a somewhat different schedule, but none of them use a model where the money supply adapts to economic conditions, which is something that is useful for moderating the effects of business cycles. Typical arguments for using these arbitrary models are that prices / interest rates will adjust to take into account the issuance rate, but this is a cop-out. In practice price levels are important psychological signposts when making economic decisions, and ideally a currency system will have some mechanism to promote price stability (not necessarily zero inflation, but hopefully low and predictable inflation). This dual mining / user coin system allows for flexible issuance models. First, mining coins, are transient by nature and their supply adapts naturally to the rate of block creation: they are created when blocks are confirmed and are also retired when blocks are confirmed, which means that demand and supply of mining coins should move together and should lead to a stable price for mining coins. Second, user coins can use any issuance model, and so decoupling the mining and user coins enables less risky experimentation with user coin issuance models. Of course this is a cursory analysis and pinning down the exact issuance and consumption model of mining coins is an important topic for further research and I’ll share some more detailed ideas in future posts.